Critical Missing Person: Grover Lee Robinson has been located. The Dallas Police Department is asking for the public’s assistance in locating a critically missing person. 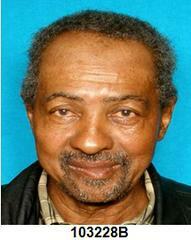 Today, on April 30, 2014, Grover Lee Robinson was last seen at his residence near 8400 Stonehurst Street. Mr. Robinson is believed to be driving his 2007 4-door charcoal gray Ford F-150 with the Texas license plate of 68D-RW4. Mr. Robinson is an Alzheimer’s patient. He is described as a Black male 73 years old 6’2”’ weighing 180 lbs., with black/gray hair and brown eyes. Mr. Robinson was last seen wearing a Navy Blue Dallas Cowboys sweatshirt, black jeans, brown shoes and still has the goatee as shown in the picture below. If anyone has any information regarding the whereabouts of Mr. Grover Lee Robinson, please call 911 or contact the Dallas Police Department Missing Persons Unit at 214-671-4268. This critical missing report is documented on case number 103228-B. If anyone has any information regarding the whereabouts of Mr. Grover Lee Robinson, please call 911 or contact the Dallas Police Department Missing Persons Unit at 214-671-4268.